Hundreds more Ethiopian troops moved into a second Somali town on Saturday to protect the country's weak, U.N.-backed government, and talks aimed at easing tensions here fell apart when Islamist militia delegates walked out and the government did not send representatives. About 200 Ethiopian troops with at least five pickup trucks mounted with machine guns and other vehicles moved into Wajid, a U.N. aid base, about 46 miles southeast of the Somali-Ethiopian border, at about 3 a.m. (0000GMT), several witnesses said on condition of anonymity because they feared reprisals. The soldiers took control of the town's airport from a militia serving the local administration, they said. Arab League talks in Sudan, scheduled to resume Saturday, were aimed at easing the situation in Somalia, where the Islamist militia captured the capital, Mogadishu, from secular warlords and then consolidated their control over most of southern Somalia. Both sides signed a temporary cease-fire agreement June 22, and the Islamists formally recognized the government, something they had previously said they would not do. The talks fell apart Saturday when the Islamists walked out because of the Ethiopian incursion, and the government side said it would not attend until it received international guarantees that any agreement would be respected. "The reason why we are walking out of the conference is that the Somali government has violated the accord and allowed Ethiopian troops to enter Somali soil," said Abdirahman Janaqaw, the deputy leader of the Islamic courts' executive council. Representatives of the Islamic courts have been in Khartoum for the past week, but no government representative had shown up in the Sudanese capital. "We will no longer stay in Khartoum and, although the delegates of the government have not arrived in Khartoum, we will walk out of the conference," Janaqaw told The Associated Press in Mogadishu. Ethiopian and Somali government officials have denied Ethiopian troops are in the country. "There is not a single Ethiopian solider on Somali soil. I deny that the Ethiopians have taken control of Wajid. Our troops control there," Deputy Information Minister Salad Ali Jeeley told The Associated Press in Baidoa, where the fragile transitional government is based. In the town of Wajid, the base for southern Somalia operations for U.N. agencies and other aid organizations, residents said the Ethiopian troops did not meet any resistance when they took over the airport. Aid workers and U.N. staff in the town also said there were Ethiopian soldiers in Wajid. They, too, asked not to be identified by name because of the sensitivity of the issue. Wajid, which has experienced relative peace compared with other southern Somalia towns, such as Baidoa, is run by a clan-based administration that has not allied itself with the transitional government or with the Islamists. Ethiopian troops first moved into Somalia on Thursday to protect the government, which has been challenged for power by Islamic militants. A force of more than 400 Ethiopian troops entered Baidoa, 150 miles northwest of the capital, Mogadishu, which the Islamic militia controls. The militia, which also took control of most of southern Somalia over several weeks of fighting last month, deployed some of its fighters to within striking distance of Baidoa on Wednesday. But they pulled back as the Ethiopian troops moved in. 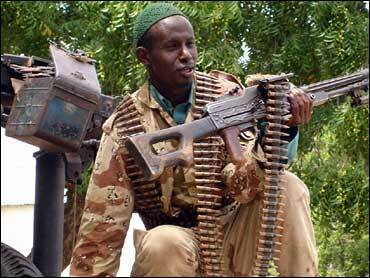 The Islamic militia's leader responded to the Ethiopian incursion by calling on all Somalis to wage holy war against Ethiopia, a largely Christian country that is Somalia's traditional enemy. Sheik Hassan Dahir Aweys, in a radio broadcast on Friday, said Ethiopia was seeking to bolster what he described as a puppet regime. He said President Abdullahi Yusuf, his longtime rival, has "been a servant of Ethiopia for a long time." Residents of Baidoa reported seeing hundreds of Ethiopian troops, in uniform and in marked armored vehicles, entering Baidoa on Thursday and taking up positions around Yusuf's compound. Somali government leaders may be reluctant to acknowledge that Ethiopian troops have come to their aid because they do not want to appear to be beholden to the country's traditional adversary. Anti-Ethiopian sentiment still runs high in much of this almost entirely Muslim country. Ethiopia's move could give the internationally recognized Somali government its only chance of curbing the Islamic militia's increasing power. But the incursion could also be the pretext the militiamen need to build public support for a guerrilla war.